It will be bowl-speed ahead this week, as a Penn State contingent is flying off to Orlando to handle logistics for the Nittany Lions’ game against Kentucky there on Jan. 1. But there’s a lot more going on behind-the-scenes between now and the final “regular” signing date of Feb. 6, 2019. Personnel changes — both players and coaches — may be in the offing, as a couple of Nittany Lions must decide by Jan. 14 if they want to declare for the NFL Draft (hello, Miles Sanders). Also, Franklin has certainly already evaluated if he wants to make any adjustments on his 10-man staff of full-time assistant coaches. According to NCAA rules, teams participating in the postseason are permitted “three practices per week of live contact (including two thud) and [and] three days of non-contact or minimal contact practices per week” in advance of the bowl game. A week or so of the practices will be held on campus and the remainder will be on-site. This is a key development time, with lots of younger players sure to get some extra reps. And remember, freshmen can play up to four games this season and still retain their four years of eligibility, so there’s the possibility that several rarely-used first-year players will see action in the Citrus Bowl. Every December, the State College Quarterback Club hosts its annual football banquet, honoring the Penn State seniors. 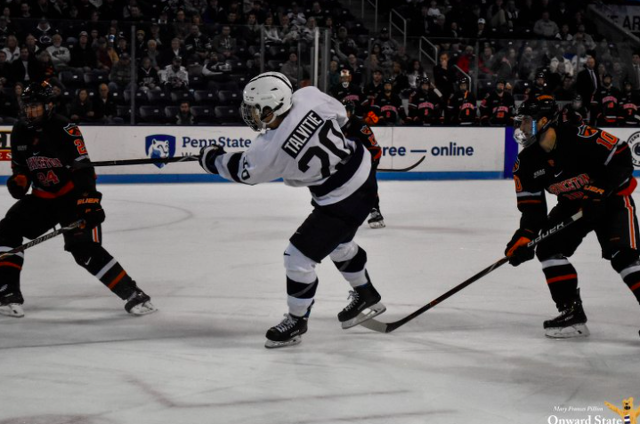 It’s held in The Penn Stater Conference Center Hotel and has hundreds of guests in attendance, including the families of departing PSU players and undergraduate managers and trainers. Nearly two dozen awards and post-grad scholarships are handed out, such as the team’s most valuable player and other such honors as highest GPA, The Iron Lion and the scout team players of the year. Prior to the onsite, pre-bowl availabilities in Orlando, Franklin typically meets with the Penn State beat reporters two times before Christmas. Why is this important? It’s these two sessions that provide the fodder for nearly three weeks of ensuing articles, videos and analysis. The first is a “bowl media day” held at Beaver Stadium on the 14th, and includes the head coach and a number of players. The second comes on the first day of the early signing period, which is Dec. 19. In addition to Franklin, also typically available are defensive recruiting coordinator (and cornerbacks coach) Terry Smith; first-year offensive recruiting coordinator (and tight ends coach) Tyler Bowen; and longtime director of player personnel Andy Frank, who has been with Franklin since Day One at Vanderbilt. Last December was the first time for the new early signing period for FBS schools. Penn State had 22 players sign their national letter of intent that day, which was par for the course. According to the NCAA, 90% of FBS recruits and more than 70% of the country’s top 250 prospects signed their NLI during the early period last December. This year, the early signing period will run from Wednesday, Dec. 19 through Friday, Dec. 21. Mid-year junior college transfers can also sign beginning the 19th, with the JC signing period ending on Jan. 15. The “regular” signing date is Feb. 6, 2019. According to Blue White Illustrated, a total of 17 high school prospects have verbally committed to Penn State, led by five-star running back Devyn Ford from Virginia and such well-known names as State College’s Keaton Ellis and cornerback Joey Porter, Jr., whose father was an All-Pro linebacker with the Pittsburgh Steelers. After every season, there is always a handful of players who announce they are leaving Penn State. Freshman Isaiah Humphries, a safety from Texas, Tweeted last week that he was transferring. That’s bigger news than usual, since his father Leonard played for Penn State from 1988-92. A departure like that can cause some buzz among the legion of Lion lettermen. Humphries was the first player this postseason to announce his exodus, but he won’t be the last. It’s also possible that Franklin could make changes on his coaching staff. He sang the praises of his defensive coaches after the Maryland game (rightly so: PSU held its final three regular-season foes to a collective 20 points, the best such finish since 1985), so if there is any movement expect it on the offensive side of the ball. That singing, by the ay, included special teams coach Phil Galiano, in his role as assistant D-line coach. Here is Franklin’s history of changes among his assistant coaching staff as a head coach: Vanderbilt — two changes after 2011 (6-7 record) and zero after 2012 (9-4); transition from Vandy to Penn State — two; Penn State — zero after 2014 (7-6); three after 2015 (7-6); zero after 2016 (11-3) and four after 2017 (11-2). Nov. 29, 2015 — Franklin fired John Donovan the day after PSU lost its regular-season finale at No. 6 Michigan State, 55-16. Dec. 12 — Joe Moorhead hired as offensive coordinator and QB coach. Jan. 9, 2016 — D-coordinator Bob Shoop left for the same position at Tennessee. Jan. 10 — Brent Pry promoted to D-coordinator. Jan. 11 — Herb Hand left to coach the offensive line at Auburn. Jan. 13 — Matt Limegrover hired as offensive line coach. Jan. 18 — Tim Banks hired as safeties coach. Nov. 29, 2017 — Moorhead officially named Mississippi State’s head coach. Dec. 1 — Charles Huff named Mississippi State’s assistant head coach and running backs coach. Dec. 1 — Ricky Rahne named offensive coordinator; Galiano promoted from a consultant’s role to special teams coach; Bowen, a former PSU GA, returned to coach tight ends, after stops at Fordham and Maryland. Jan. 12, 2018 — David Corley hired as running backs coach. Jan, 19 — Wide recovers coach Josh Gattis leaves to be co-offensive coordinator and WR each at Alabama. Jan. 25 — Ja’Juan Seider hired as running backs coach; Corley re-assigned to wide receivers. As many as seven recruits in the Class of 2019 could enroll next month, led by quarterbacks Ta’Quan Roberson and Michael Johnson Jr.
Penn State starts its 2019 spring semester classes on Monday, Jan. 7, with arrival day for new students on Saturday. Jan. 5. There has been a total of 24 January enrollees since Franklin became head coach at Penn State — counting the five who early enrolled in January 2014, before Franklin was officially hired. The breakdown, by year: five in 2014, five in 2015, four in 2016, four in 2017 and six in 2018. Of that group, only a half-dozen players have emerged as starters: wide receiver DeAndre Thompkins and offensive lineman Chasz Wright (2014), kicker Tyler Davis (2015), offensive lineman Connor McGovern (2016), wide receiver K.J. Hamler (2017) and Micah Parsons (2018). More than 5,000 football coaches will gather in San Antonio, Texas, for the annual American Football Coaches Association (AFCA) convention. Franklin and most, if not all, of his coaching staff will be in attendance. This is a huge networking opportunity and a place where Franklin can continue to add to his legendary binder full of potential coaching assistant hires. The convention is also a hotbed of formal and informal interview activity, as it’s a one-stop shopping locale for programs looking to hire and coaches seeking new positions. In addition, Bowen will take part in the AFCA’s "35 Under 35" Coaches Leadership Institute at the convention, and in PSU coaches have part of panels and chalk talks. The full schedule has not yet been released. No, not with Fumi. With the object of his Pennsylvania heart — Penn State. Jan. 11 will mark the fifth anniversary of the hiring of Franklin as Penn State’s 16th head coach. At age 46, he has a 45-20 record at PSU. His victory total already ranks him fifth all-time among Penn State head coaches, behind Joe Paterno (409), Rip Engle (104), Bob Higgins (91) and Hugo Bezdek (65). By the way, Franklin will receive a “retention bonus” of $300,000 this Dec. 31 (on the eve of the Citrus Bowl) for being Penn State’s head coach. Couple that with a $200,000 bonus for taking Penn State to a bowl game, and his take-home for 2018 will be a cool $5 million. A spot in the Peach Bowl, a New Year's 6 bowl, would have earned CJF another $100k. His compensation in 2019 will be at least $5.85 million, figuring on a retention bonus and a bowl game appearance — that's over $16,000 a day. Franklin’s contract runs through Dec. 31, 2022 — at which point, if he is still at Penn State, he’ll receive a $1 million bonus. Penn State’s leading candidates to declare early for the NFL Draft are running back Miles Sanders and defensive end Shareef Miller. Sanders is a true junior and has played all three of his seasons at Penn State. Miller redshirted as a freshman in 2015, and while a senior academically, Miller has another year’s worth of college eligibility in 2019, if he chooses to return. Then there’s cornerback John Reid. If he hadn’t missed all of 2017 following knee surgery, Reid would be a near-certain candidate to declare for the 2019 draft. Reid, who faced some hurdles getting back into the flow of live action early in 2018, had a good second half of the season. Although he is eligible to return to PSU for a final season in 2019, he could be thinking about declaring for the draft, emboldened perhaps by the success of former Nittany Lion cornerback Grant Haley — of diminutive stature, similar to Reid — with the NFL’s New York Giants as a rookie. Other current Nittany Lions who have three years in at Penn State and would be eligible for the 2019 draft include defensive lineman Kevin Givens, offensive linemen Ryan Bates and Connor McGovern, and wide receiver Juwan Johnson. If Johnson hadn’t gotten injured and had matched his 2017 output of 54 receptions for 701 yards, there’s a decent chance he would have thought about leaving early. Now, with only 23 catches in 2018, not so much. For the 2017 NFL Draft, 106 undergraduates received NFL approval to enter the draft, as did 13 players who graduated without using up all their college eligibility. Quarterback Trace McSorley and cornerback Amani Oruwariye have already accepted invitations to play in the Reese’s Senior Bowl in Mobile, Ala. The game is held on Saturday, Jan. 26, and will be broadcast on the NFL Network. Much more important than the game are the week of practices, private meetings with team executives, physicals and lobby sit-downs that McSorley and Oruwariye will go through. In some ways, that week is even more critical than the NFL Combine, since all 32 NFL teams send a fleet of coaches and execs to Mobile, where they get a lot more up-close and personal time with the NFL prospects. Both Penn State players should shine here, given their football savvy, overall maturity and accomplished ability to handle themselves well in interview situations. McSorley’s stock, if he does well in practice, could especially rise this week as well. That was the case with Baker Mayfield at the 2018 Senior Bowl's practice week. Only college seniors and fourth-year junior graduates are eligible for the game. Fourth-year juniors must graduate by this December to be eligible to play in the Senior Bowl. Final rosters are released Jan. 16. 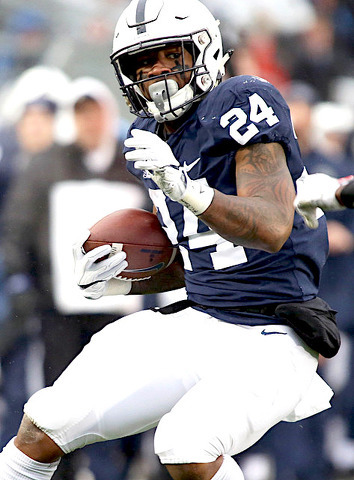 In 2018, Penn Staters DaeSean Hamilton, Mike Gesicki, Marcus Allen and Christian Campbell took part in Senior Bowl practices, although just Hamilton and Gesicki played in the game. Both were coached by the Denver Broncos’ staff, which was a big contributing factor to the Broncos’ drafting Hamilton in the fourth round and 113th overall. Speaking of the NFL Combine: It will be held Feb. 26 to March 4 in Indianapolis.